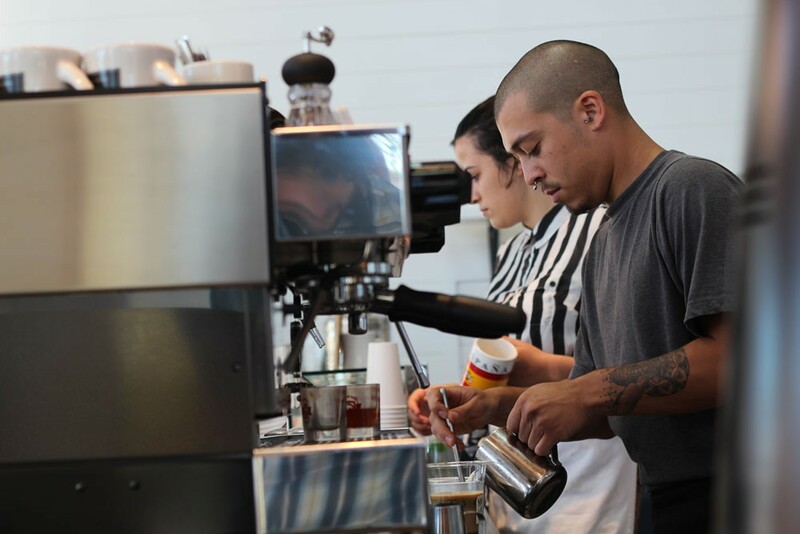 CAFFEINE SCENE Jasmine Partida and Cary Escovedo at Acre Coffee, where the process is as important as the result. Philosophy degree? Yeah, that and two bucks will get you a cup of coffee. "What's that saying, 'Jack of all trades, master of none?'" says Steve Decosse, owner of Acre Coffee. Describing his Master's degree in integral philosophy, the Midwest-raised deep thinker suggests with a smile, "It's more like jack of all trades, master of the nothingness. The process is more important than the content." Acre Coffee's shops in Petaluma (which opened in 2011), San Francisco (2012) and Santa Rosa (2013) all offer single-origin specialty coffees brewed by trained baristas, but they offer more than just what's in the cup. The new shop in Santa Rosa, for instance, was designed to let in as much light as possible; with odd angles and high ceilings, it feels open and calming, a comfortable space to linger, talk, read a newspaper or get some work done on deadline. In Petaluma, the shop has a homey feel, with natural wood counters and windows that open to the street on a less-traversed area of Kentucky Street. The "neighborhood coffee shop," in fact, is something that Decosse feels was missing from the city. "People always say to us, 'after Deaf Dog closed, we were lost,'" says Decosse. The independent coffee chain headquartered in Petaluma filed for bankruptcy in 2006; a Starbucks, which moved in across the street, still thrives. "[Starbucks] is a really aggressive company," says Decosse. "I think I want to come across with a positive message. I think about it a lot, actually." Decosse's background as a former yoga instructor shows in his business. "Slow and steady wins the race," he likes to say, and to that effect, Decosse opened Slow Club, a restaurant in San Francisco's Potrero Hill, over 20 years ago and was a business partner in Healdsburg's Acre Cafe in the late '90s. He also founded Acre Gourmet, a company dedicated to serving high-quality school lunches. The concept has taken off in private school settings, with Acre placing chefs at school sites to create custom meals; Decosse also offers consulting for public schools. Education extends to Acre's coffee shops as well. Once Acre begins roasting its own beans, offering them alongside roasts from Verve (Santa Cruz) and Sightglass (San Francisco), "then we'll offer public tastings and classes on home brewing," says Decosse, who moved to Portland, Ore. for three months to experience the concept first-hand from the experts at renowned roaster Stumptown Coffee. In the coffee world, process is everything. Decosse knows his customers care about the beans' origins, and will be among a rare but increasingly popular breed of cafes serving beans from different roasters, a formerly taboo trend that's now catching on in big markets like New York City and San Francisco. "It's like a wine tasting room," says Decosse. "You want to bring the best of a region into one place." The Bohemian's Java Jive reading takes place Thursday, Oct. 17, at Acre Coffee. 2365 Midway Dr, Santa Rosa. 6pm. Free. 707.595.5984.